By Silicon Valley Robotics via Robohub: The area of service robotics is getting active, with a new retail robot startup launching today. Tally is one of several robotics startups launching today at Haxlr8r’s 7th Demo Day. 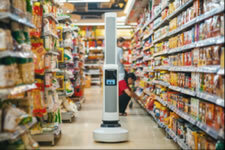 Tally is an inventory tracking robot platform fromSimbe Robotics and the “world’s first robotic autonomous shelf auditing and analytics solution” according to the press release. Tally is in trials with several North American retailers and will traverse aisles scanning and auditing merchandise to help stores maintain ideal product placement, fill inventory gaps, and find misplaced or mispriced items. Tally is also capable of autonomously returning to base to charge.